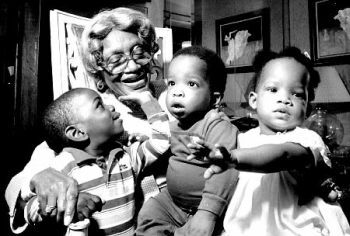 Clara McBride Hale, founder of Hale House, a nationally recognized facility for the care of addicted children, was born on April 1, 1905 in Elizabeth City, North Carolina and raised in Philadelphia, Pennsylvania. When Hale was a youngster, her family experienced tragedy. Her father died, forcing her mother to take in lodgers to support her four children. After graduating from high school, Clara McBride married Thomas Hale and moved to New York City. Together they had two children, Nathan and Lorraine, and adopted Kenneth. Thomas died, leaving Hale to support her family as a domestic. In 1969, at the age of 64, Hale became the foster parent of an infant addicted to cocaine. She responded to needs of other children with this affliction by founding a groundbreaking foster care program in Harlem, Hale House. The respite care program also provided training to drug-addicted mothers on how to improve the health of their chemically dependent babies. Hale’s unique program required mothers to live in Hale House with their children and attend a drug rehabilitation program. In the 1980s, Hale expanded Hale House services to include care for infants stricken with HIV and those who had lost parents to AIDS. By 1991, Hale House cared for approximately 1,000 infants and toddlers. During her distinguished career, Hale received numerous honors and awards for her community service. She received an honorary doctorate from John Jay College of Criminal Justice and public service awards from the National Mother’s Day Committee and the Truman Award for Public Service. In 1985, during his State of the Union Address, President Ronald Reagan referred to Hale as an “American hero” for her commitment to at-risk children. Clara McBride Hale died on December 18, 1992 in New York City. http://www.halehouse.org; Ron Alexander, “Chronicle,” New York Times, 26 Aug. 1994: 4; Diane Camper, “Mother Hale's Lasting Gift,” New York Times, 24 Dec. 1992: A16.